The maximum number of nodes supported in a Red Hat Cluster is 16. Cluster management manages cluster quorum and cluster membership. CMAN (an abbreviation for cluster manager) performs cluster management in Red Hat Cluster Suite for Red Hat Enterprise Linux 5. 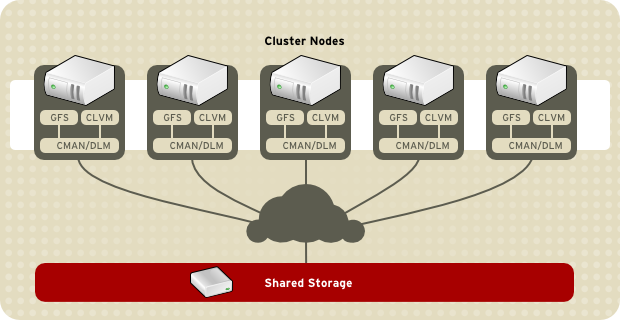 CMAN is a distributed cluster manager and runs in each cluster node; cluster management is distributed across all nodes in the cluster (refer to Figure 1.2, “CMAN/DLM Overview”). CMAN keeps track of cluster quorum by monitoring the count of cluster nodes. If more than half the nodes are active, the cluster has quorum. If half the nodes (or fewer) are active, the cluster does not have quorum, and all cluster activity is stopped. Cluster quorum prevents the occurrence of a "split-brain" condition — a condition where two instances of the same cluster are running. A split-brain condition would allow each cluster instance to access cluster resources without knowledge of the other cluster instance, resulting in corrupted cluster integrity. Quorum is determined by communication of messages among cluster nodes via Ethernet. Optionally, quorum can be determined by a combination of communicating messages via Ethernet and through a quorum disk. For quorum via Ethernet, quorum consists of 50 percent of the node votes plus 1. For quorum via quorum disk, quorum consists of user-specified conditions. By default, each node has one quorum vote. Optionally, you can configure each node to have more than one vote. CMAN keeps track of membership by monitoring messages from other cluster nodes. When cluster membership changes, the cluster manager notifies the other infrastructure components, which then take appropriate action. For example, if node A joins a cluster and mounts a GFS file system that nodes B and C have already mounted, then an additional journal and lock management is required for node A to use that GFS file system. If a cluster node does not transmit a message within a prescribed amount of time, the cluster manager removes the node from the cluster and communicates to other cluster infrastructure components that the node is not a member. Again, other cluster infrastructure components determine what actions to take upon notification that node is no longer a cluster member. For example, Fencing would fence the node that is no longer a member. Lock management is a common cluster-infrastructure service that provides a mechanism for other cluster infrastructure components to synchronize their access to shared resources. In a Red Hat cluster, DLM (Distributed Lock Manager) is the lock manager. As implied in its name, DLM is a distributed lock manager and runs in each cluster node; lock management is distributed across all nodes in the cluster (refer to Figure 1.2, “CMAN/DLM Overview”). GFS and CLVM use locks from the lock manager. GFS uses locks from the lock manager to synchronize access to file system metadata (on shared storage). CLVM uses locks from the lock manager to synchronize updates to LVM volumes and volume groups (also on shared storage). Fencing is the disconnection of a node from the cluster's shared storage. Fencing cuts off I/O from shared storage, thus ensuring data integrity. The cluster infrastructure performs fencing through the fence daemon, fenced. The fencing program determines from the cluster configuration file which fencing method to use. Two key elements in the cluster configuration file define a fencing method: fencing agent and fencing device. The fencing program makes a call to a fencing agent specified in the cluster configuration file. The fencing agent, in turn, fences the node via a fencing device. When fencing is complete, the fencing program notifies the cluster manager. Power fencing — A fencing method that uses a power controller to power off an inoperable node. Two types of power fencing are available: external and integrated. External power fencing powers off a node via a power controller (for example an API or a WTI power controller) that is external to the node. Integrated power fencing powers off a node via a power controller (for example,IBM Bladecenters, PAP, DRAC/MC, HP ILO, IPMI, or IBM RSAII) that is integrated with the node. SCSI3 Persistent Reservation Fencing — A fencing method that uses SCSI3 persistent reservations to disallow access to shared storage. When fencing a node with this fencing method, the node's access to storage is revoked by removing its registrations from the shared storage. 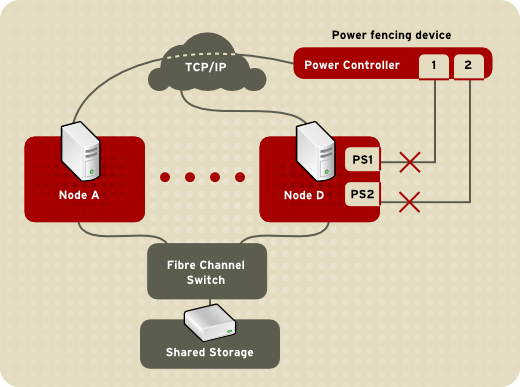 Fibre Channel switch fencing — A fencing method that disables the Fibre Channel port that connects storage to an inoperable node. GNBD fencing — A fencing method that disables an inoperable node's access to a GNBD server. Figure 1.3, “Power Fencing Example” shows an example of power fencing. In the example, the fencing program in node A causes the power controller to power off node D. Figure 1.4, “Fibre Channel Switch Fencing Example” shows an example of Fibre Channel switch fencing. In the example, the fencing program in node A causes the Fibre Channel switch to disable the port for node D, disconnecting node D from storage. Specifying a fencing method consists of editing a cluster configuration file to assign a fencing-method name, the fencing agent, and the fencing device for each node in the cluster. The way in which a fencing method is specified depends on if a node has either dual power supplies or multiple paths to storage. If a node has dual power supplies, then the fencing method for the node must specify at least two fencing devices — one fencing device for each power supply (refer to Figure 1.5, “Fencing a Node with Dual Power Supplies”). 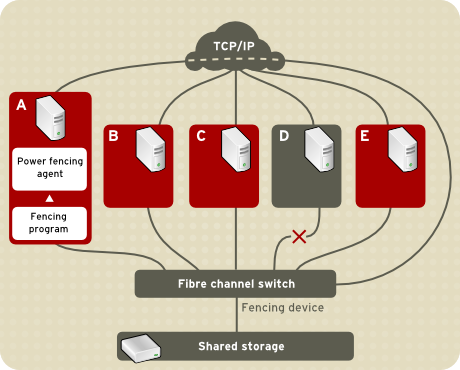 Similarly, if a node has multiple paths to Fibre Channel storage, then the fencing method for the node must specify one fencing device for each path to Fibre Channel storage. 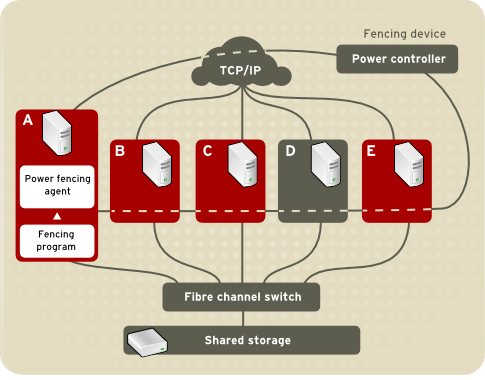 For example, if a node has two paths to Fibre Channel storage, the fencing method should specify two fencing devices — one for each path to Fibre Channel storage (refer to Figure 1.6, “Fencing a Node with Dual Fibre Channel Connections”). You can configure a node with one fencing method or multiple fencing methods. When you configure a node for one fencing method, that is the only fencing method available for fencing that node. When you configure a node for multiple fencing methods, the fencing methods are cascaded from one fencing method to another according to the order of the fencing methods specified in the cluster configuration file. If a node fails, it is fenced using the first fencing method specified in the cluster configuration file for that node. If the first fencing method is not successful, the next fencing method specified for that node is used. If none of the fencing methods is successful, then fencing starts again with the first fencing method specified, and continues looping through the fencing methods in the order specified in the cluster configuration file until the node has been fenced. 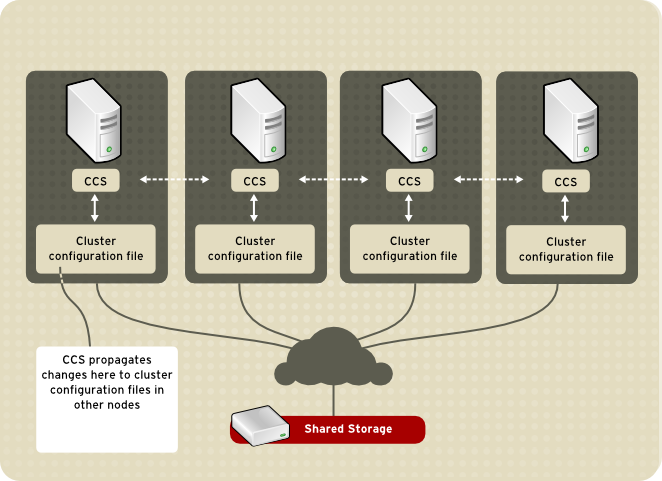 The Cluster Configuration System (CCS) manages the cluster configuration and provides configuration information to other cluster components in a Red Hat cluster. 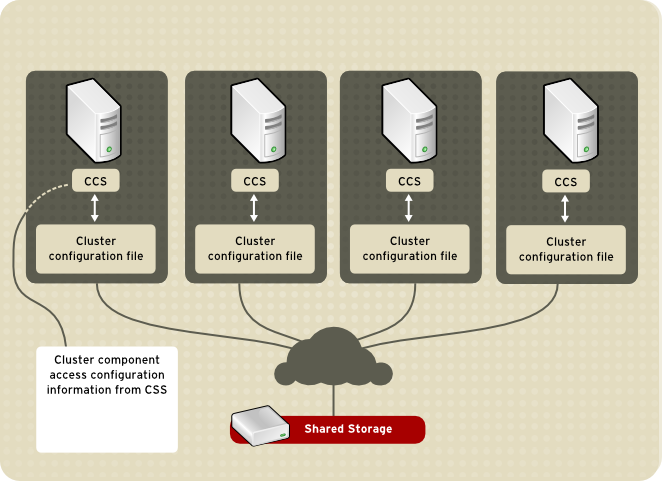 CCS runs in each cluster node and makes sure that the cluster configuration file in each cluster node is up to date. For example, if a cluster system administrator updates the configuration file in Node A, CCS propagates the update from Node A to the other nodes in the cluster (refer to Figure 1.7, “CCS Overview”). Other cluster components (for example, CMAN) access configuration information from the configuration file through CCS (refer to Figure 1.7, “CCS Overview”). Cluster name — Displays the cluster name, cluster configuration file revision level, and basic fence timing properties used when a node joins a cluster or is fenced from the cluster. Cluster — Displays each node of the cluster, specifying node name, node ID, number of quorum votes, and fencing method for that node. Fence Device — Displays fence devices in the cluster. Parameters vary according to the type of fence device. For example for a power controller used as a fence device, the cluster configuration defines the name of the power controller, its IP address, login, and password. Managed Resources — Displays resources required to create cluster services. Managed resources includes the definition of failover domains, resources (for example an IP address), and services. Together the managed resources define cluster services and failover behavior of the cluster services.